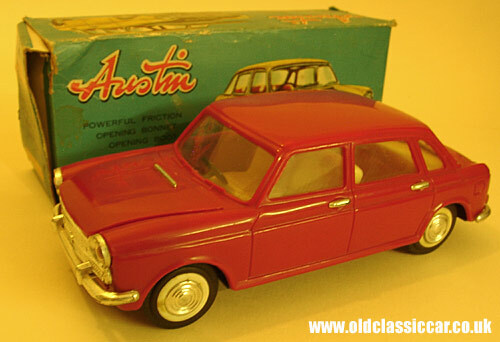 Austin 1800 toy by Clifford. 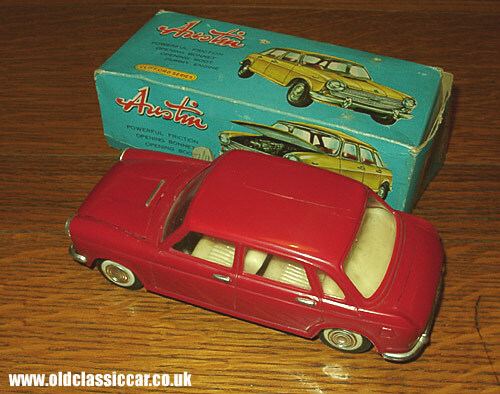 Alan has a number of Clifford toys in his 'fleet', such as this FB Vauxhall Victor and the boxed Austin 1800 you see here. The bonnet and boot both open on this neat little plastic toy, and forward motion is courtesy of a friction motor, as is often the case with this type and age of toy car. From the photographs, this car looks to be based on the early 1800 'landcrab', identifiable from the later cars by its horizontal, rather than vertical, rear tail lights, and also the front grille treatment was different on later incarnations of the 1800. The real car, designed by Alec Issigonis whilst at BMC, was powered by a transversely mounted B Series engine, driving the front wheels. Even though it was a large car, the interior space was staggering, a fact not lost on mini cab drivers of the day (for example Radio Cabs, of Sale in Manchester, who operated 1800s in the 1960s). Performance of the standard car was reasonable, although for extra oomphhh you could always plump for the 1800S, which had twin carbs to perk up the engine's power output.